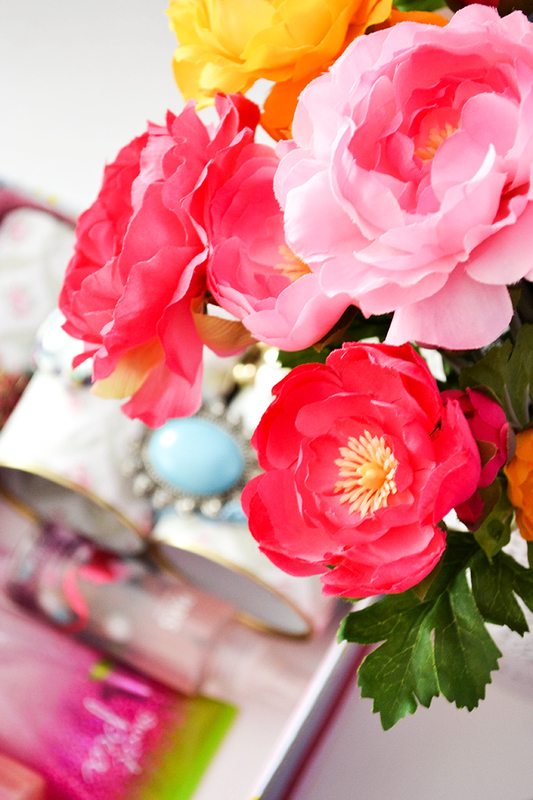 Following feature prima of my Vanity Rehab series, here's one which may remind you of one of my other quite popular DIYs. 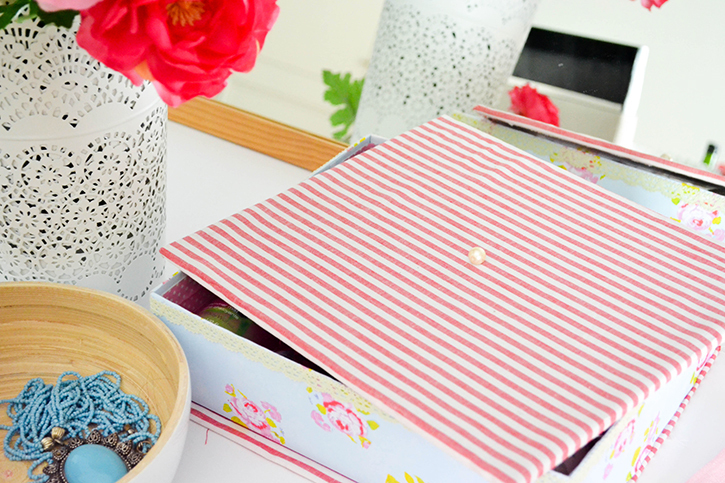 Remember this DIY Ring Box I made over here using hair curlers? The idea is the same, but this one's for all your arm candy. Yup all that stash of bracelets, cuffs, bangles and watches. I really love how it turned out. My version as usual is OTT girly, but I'm sure not everyone goes nuts over florals and cute pastel patterns, so you could do yours in stripes, or solid colors, anything. 1.A cardboard box (Don't get one from the store. 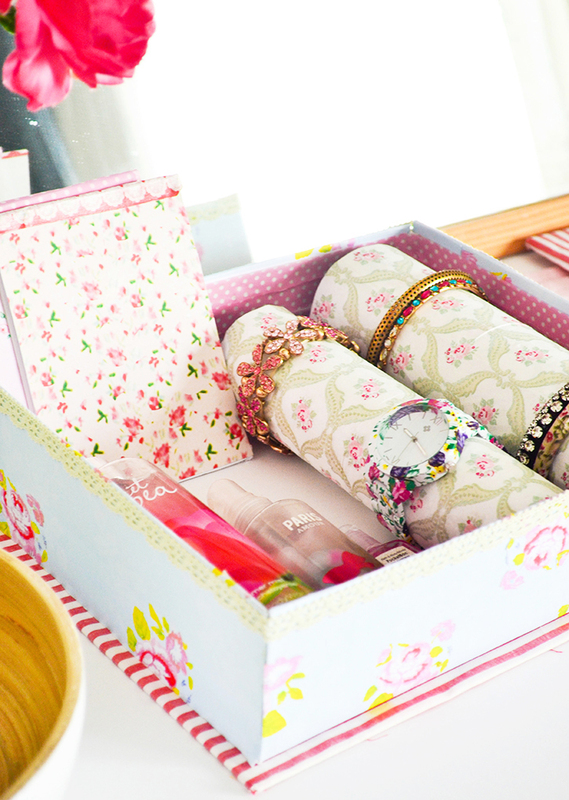 you know it's time to upcycle your shoeboxes now and subscription boxes.) I made one myself because I needed specific dimensions to fit on this cute table by my mirror. PS: Make sure that one of the sides of whichever box you use is slightly larger that the length of the toilet paper tubes! PS sequel: I lined the inside of the box with coordinating washi tape just to fancy it up. 2. Next, just trim and adhere the double sides tape to the length of the tubes and start wrapping the napkin just like how you'd do for a shawerma. Totally insane comparison, yep. 3. Since I used an entire napkin to hide the brown undertones of the tube, there was extra length of the napkin left on either side of the tube which... I pushed down into both the open ends giving the impression that the napkin covers the inside of the tubes too. 4. This step is optional. To secure the tubes down onto the the box's base, I glued a velcro dot in the middle of the tube's base side down. Center the tube exactly in the middle so you have a little space left on either side to lift up the tube. And now with all the wrapping, I'm really craving a shawerma. 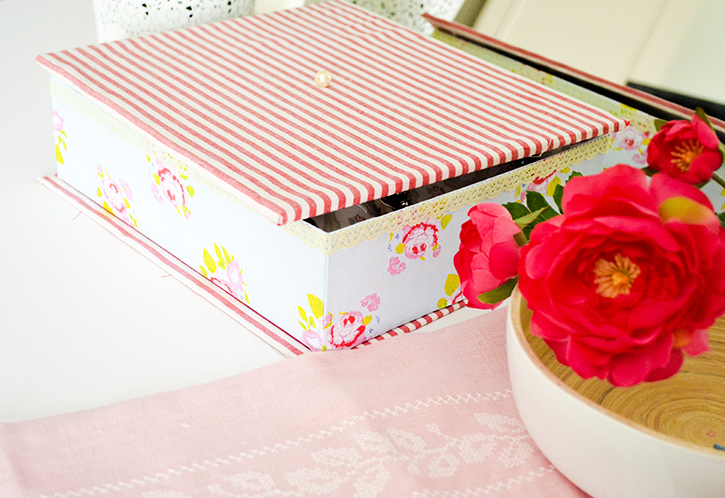 And don't forget to join everyone who is doing the hot stuff: Pinning interesting DIYs! Looked so sweet that I couldn't resist snapping away pictures of this new homemade fab-ness. 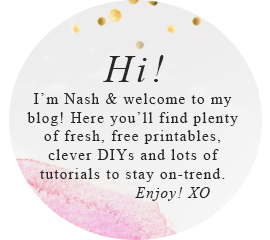 Subscribe to me down below if you'd like more ideas on hand-crafted fabness in your inbox! You can also follow me on Facebook, Pinterest aaaaand Insta to never miss an update! 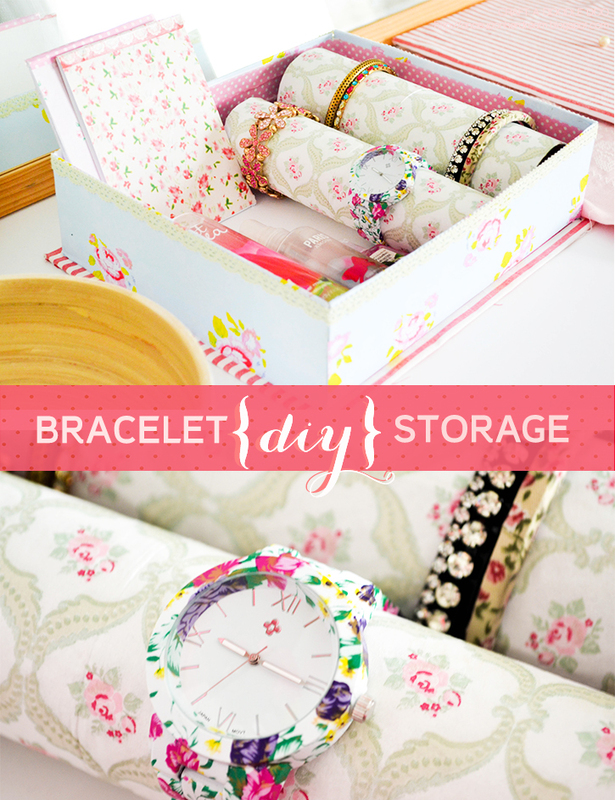 I have TONS of other jewelry organizing ideas in my DIY Gallery. Don't miss them! Wow, this is so clever and looks so posh! I would never have guessed you used toilet paper tubes to make this! Love! 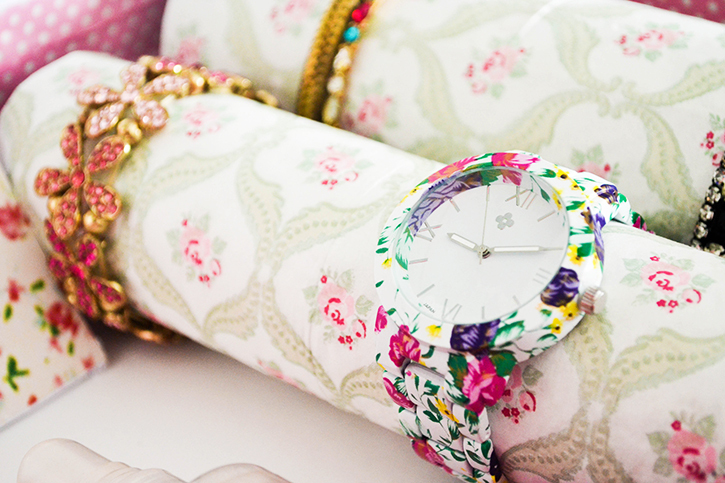 where did you get that floral watch?! I love it!! Such a lovely idea, definitely adding this to my to do list! very nice. wouldn't have thought of using tissue rolls. First time visiting your site. It's a practical diy project. So beautiful.